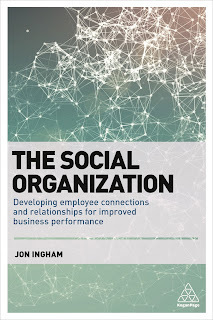 'Social Advantage' has become 'The Social Organization'. My new book which has been informed by these blogs is now out. How to leverage social media properly? Are organizations exploiting social media to reach external audiences? Who is using social media in the workplace? Do organizations provide any social media training to employees who engage in social media activities? These are only a few questions that were asked in the SHRM Survey 2011: Social Media in the Workplace. The results were rather startling. They revealed that while 68 % of organizations leverage social media to reach external audiences, only 27 % of them provide employees with training on how to work with social media. Are you among them? Are you looking for a change? At this one-of-a-kind event participants will meet highly qualified experts from Microsoft, Deloitte, LinkedIn, Twitter, Nokia, Orange, Ford, Unilever, Vodafone, Dell, Samsung, HSBC, etc. These forward-looking, top-level enthusiasts working in the strategic communications industry and new media will focus on the importance of embedding digital thinking and social media impacts in HR practice. In order to bridge the gap between the necessary and real-life practice we have chosen topics including social engagement, recruitment futurology, digital networks, social media footprints, risks and exploitation of social media strategies and much more. Fleming Europe's premiere cross-industry HR event is aimed at Senior Executives responsible for Talent, Recruiting, Knowledge Management, Employee Engagement and Learning as well as Communication Executives responsible for Employer Branding, Internal Communication and Social Media. I hope you can join me there. And I’ll be live blogging from the event here too. I followed the tweets from the Social Business Strategy Summit in London last week. I didn’t get to go as 1. I was busy, 2. they didn’t invite to speak and 3. I’ve been getting increasingly irritated by how much focus there is on IT in these events to the exclusion of all else. It’s absolutely not that I’m against technology, but it doesn’t need to be the starting point! (see it’s not not not about the technology). @hyounpark And funny enough I would include HR in that lot, too! Interestingly enough hehe #sbss12 we had it right at the heart! I do think some of the remarks were unfair – HR (or more precisely often OD) is doing some great work in this area. But I do wish HR practitioners would show more interest in the non-HR areas of social business too.